T he Momma foxes are working hard to bring home food for their young. They are working 24/7, day and night. Please remember that Red foxes are NOT NOCTURNAL! It is normal to see them at all times of the day. The moms are working especially hard to catch mice, squirrels, rats and rabbits to feed themselves and their young. They are working so hard and are so focused that they will trot right past you, through your yard, past your dogs and cats as they move from their hunting grounds to their den. They are not interested in eating your dogs or cats. 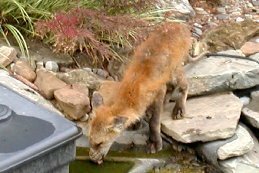 A Red fox will chase a cat that gets too close to her den- Cats are very curious and often end up in places they shouldn’t be. A momma fox is concerned about having a cat too close to her pups, so she will chase kitty right back home, up onto your porch or tree it. She isn’t interested in eating your cat – she just wants it to go away from her pups. Please keep in mind, for the safety of your cat from other predators such as great -Horned Owls who now have hungry young in the nest, keep your cat indoors, especially at dusk and dawn when owls are hunting. 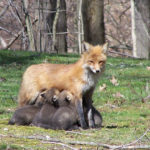 If you have a fox den, or even a skunk or raccoon with young that are in a place where you don’ want them, such as under a porch or back yard shed, its easy to convince mom to move her babies! Coyote urine is easily purchased online (and in special circumstances, picked up, free, from us!) and no momma wants to raise her young where a coyote is hunting. I simply put coyote urine infused pine shavings in the area where the unwanted family is. They generally are gone in the morning! 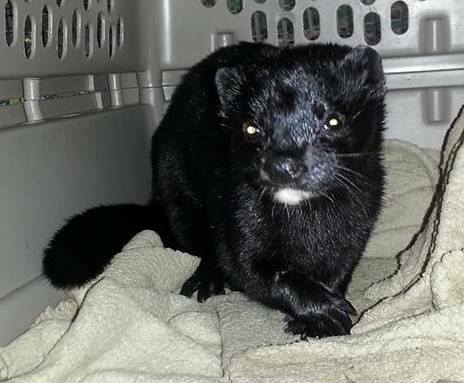 Trying to Live trap and “relocate” a family of foxes, skunks or raccoons is a futile effort and usually ends up creating orphans. Try the coyote urine- it works, and is humane because Momma moves the family to a different place all by herself. WARNING! 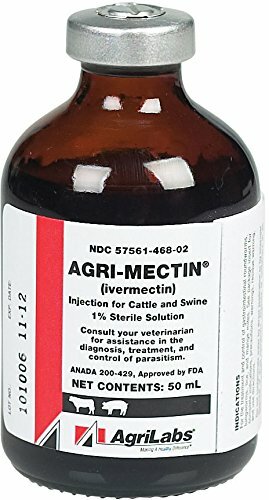 Use ONLY the INJECTABLE Ivermectin NOT the “POUR ON”, as the agents for carrying the pour-on through the skin are highly toxic if ingested! If anyone tells you differently, they do not know what they are doing! Do not use the Horse wormer paste! WARNING! 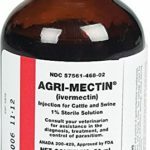 Ivermectin can be deadly to collie breeds of dogs, such as Collies, Shelties, Border Collies, Australian Shepherds and high mixes of these breeds. Please be sure before you treat a fox, that there is no chance one of these breeds can have access to the medicated food or medication. Step 1: Put Dry cat food on the ground in the same place every day for the fox. Step 3: Place 1 treated meatball on top of the cat food, place the other meatballs in the refrigerator. Step 4: Every 5 days, place another treated meatball on the cat food. Do this for 3 weeks. Step 5: Every 10 days place another treated meatball on the cat food. Do this for three more weeks. Consideration: If you are not sure the fox is getting the meatball with the medication in it, or there are more than one ill fox, put one meatball on the cat food pile, and toss two other treated meatballs in different directions, about 50 feet from each other. Here are the best blunt needles and 1 mL syringes available on Amazon.com to use : 1mL Syringe with 18Ga 1.5″ Blunt Needle and Plastic Needle with Matching Cap (Pack of 10) . They are a 1mL Syringe , so you can easily measure 0.2 Ml, just draw the ivermectin to the “.2” near the opening of this syringe. You just need a drop! Foxes will often come in close to humans to raise their young , choosing the lesser of two perceived evils- human danger or coyote danger. Because they compete for the same food source, a coyote may kill young foxes to make sure there is plenty of food for her own pups. Foxes will often choose to have their pups close to humans, where the coyotes are less likely to find them when they are very young. As the pups get older, usually around June or July, they are more able escape a coyote on their own, and the coyotes are too busy raising their own families to bother much with foxes anymore. 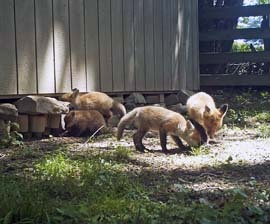 At this time, the young foxes will leave the safety of the yard for more wild places. soon after that, usually starting in September, the foxes will disperse, often travelling more than 100 miles to find a new territory. 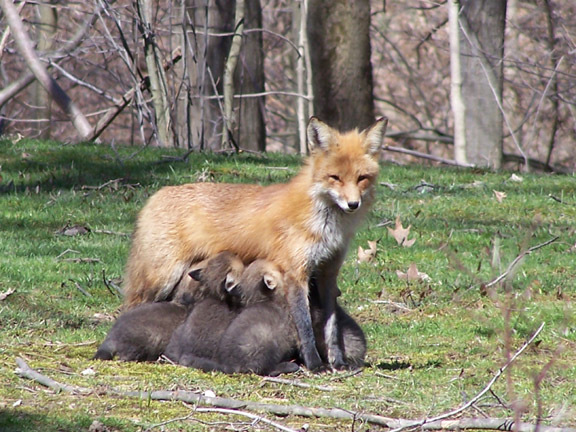 Watching a fox family grow up is a very safe, entertaining and educational way to enjoy Spring and part of Summer. Before you decide to evict the family, consider allowing them to rent your space, and in turn, you and possibly your neighbors will have a rodent free yard and what will most likely be your best gardens ever. In addition, you may also be able to take some very beautiful photos and cute videos! A healthy fox family won’t hurt children or pets. The most a protective action a parent fox might take is chase a domestic cat that gets too close to her babies back to your back deck or up a tree. 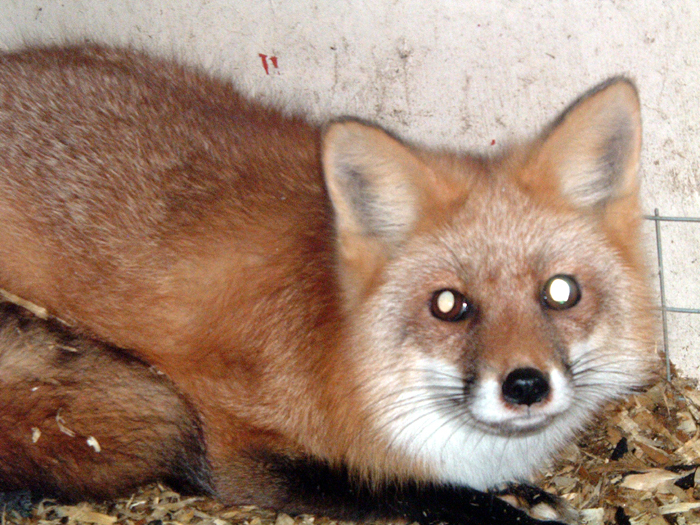 Foxes don’t want to kill or eat your dogs, cats or kids. The average fox rarely tops 11 pounds. It is very important to know that a mother fox will hunt all times of the day and night. Often the male will leave early on, leaving the female to work very hard, hunting 24/7 to bring back food for her growing pups.Unfortunately, humans who don’t know this will be alarmed to see a fox running through their yard during the day and sometimes extreme action such as shooting the mother fox will be taken, creating orphans. Because momma foxes are often crossing roads more often, sometimes she will be hit by a car. If this happens, a trail cam to make sure that the pups are indeed orphaned will help to determine what action to take if any. Often orphaned pups are old enough to survive and leave on their own. Contacting a knowledgeable Wildlife Rehabilitator at this time can help determine the best course of action. If you choose to convince the foxes to move, the earlier you do it, the better. The older the family gets, the less the female is sensitive to interference. Because a mother fox is concerned about coyotes, using coyote urine in the area will make her think a coyote is around. 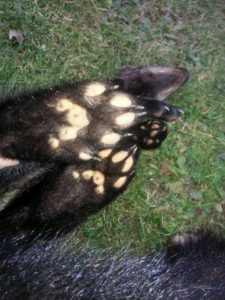 It is very likely she will move her pups within days to a new secret location far from the “marked” area. Sprinkle the coyote urine around the den area. Again, the younger the pups are, the more effective this is. Putting a foreign object such as a chair near the den may also help convince mom that her den has been discovered. However, keep in mind we don’t want to frighten her too much so that she isn’t comfortable retrieving her pups and we want to make sure she has a clear and safe entrance and exit to get them out one by one. Often simply increasing your activity in the area works. Don’t be afraid to use your deck, mow your lawn, do your gardening. Mother foxes aren’t aggressive protectors like grizzly bears. The most they will do is stand at a distance, watching you and bark a warning for her pups to take cover because danger is near. This is not a warning to you, it is a warning to her pups- YOU are the danger. Balloons are very scary to foxes, especially when they move in the breeze. Punch balloons, sold as children’s toys are inexpensive and hardy and when a small handful of beads or pebbles are placed inside them before inflated, they make scary noises too! When placed appropriately about 2 feet off the ground, they will discourage a fox from coming into or traveling through your yard. 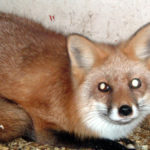 Hiring a Nuisance Control company to trap and remove the foxes rarely works out well for the foxes or your pocketbook. Only the very young will be captured, and usually only a few. The parents will not be easy to catch, and relocation is not going to work. Most likely all that will happen is the fox family will be fragmented or destroyed and you will spend a lot of money. 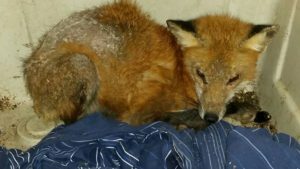 “Relocation” of a fox family by a trapper is not realistic, so please don’t fall for that. You will be wasting your money. As suggested earlier in this piece, to convince the female to relocate her own family using one or all of these methods mentioned is the most effective and humane way. Most likely, the family will be gone by late June or July. Foxes only use a den to raise their families, and the rest of the year, they are nomads, napping under trees and wherever they find a quiet place. If you don’t want them back again next year, mid-July is the time to do repairs and permanent exclusion from the area with strong fencing, concrete block, or rocks. This will prevent not only foxes, but skunks, raccoons and woodchucks from using the space to raise their young. 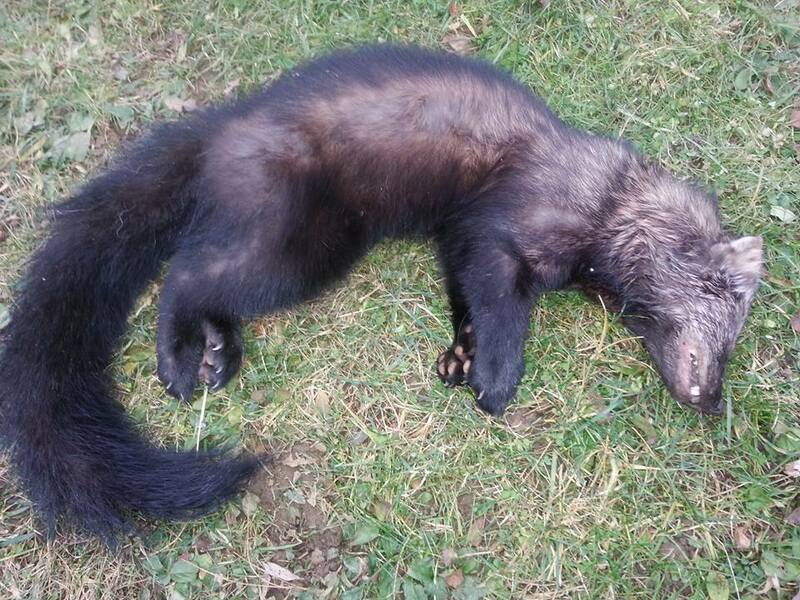 We don’t need to tell anyone how deadly and dangerous snares are for all animals , both wild and domestic.. This beautiful male red fox got caught in an improperly and illegally set snare trap. The wire cut deep into his neck as he ran with the device until the stake got snagged on a fence. He was discovered by a homeowner who called for help. the wire was cut off of his neck, but not before significant damage was done. Though the fox was free of the wire, it had dug so deeply into his neck that nerve damage affected not only his eye, but his trachea. 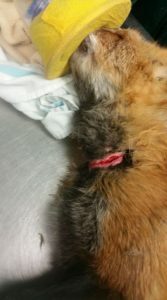 Because of the nature of this damage, he had to be humanely euthanized. Did you know that there is a bill currently being sponsored by the trapping associations to legalize these horrific snares in New York? What a step back this would be. This sweetheart was found in Orchard Park, NY, dying from a nasty skin infection brought on by Sarcoptic Mange mites. 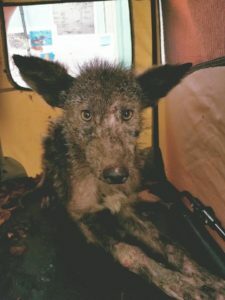 She was treated for the infection with a long-acting antibiotic, given life-saving fluids and mange medicine was applied. 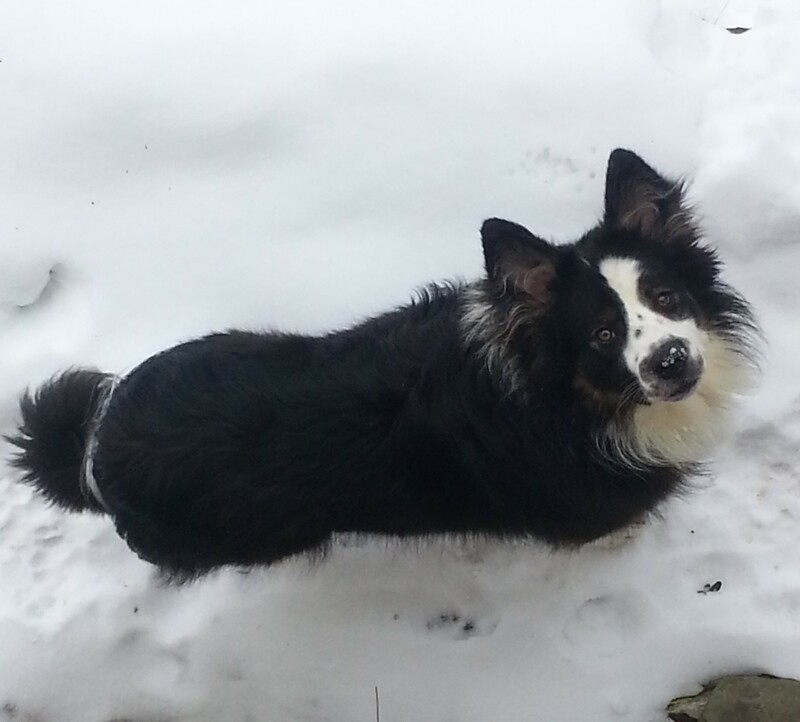 She is presently being cared for at Fox Wood, and is a model patient – compliant and gentle. 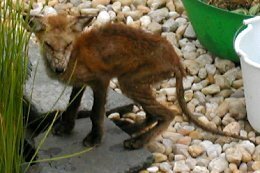 Because the Mange and infection creates a situation where they are also starving, she is being fed small amounts of easily digested food many times a day. Please check out our wishlist on Amazon.com if you would like to contribute to her care. We are also accepting donations through PayPal (foxladye@yahoo.com). We are hoping to be able to release her in Spring .